The Harper glacier could be considered an extension of the Muldrow, but with a distinctly different flavor. After the Icefall we skirted on Karstens ridge, the Harper exists solely above 15,000′ and is one of the coldest, most windswept, and barren places in commonly travelled mountaineering. Stories of demolished tents and bitter temps humbled our expectations and set our senses on edge for this portion of the route. After rescuing the Russian guys, the weather closed in and we declared a rest day. July 3 we woke up ready to roll but found our tracks from June 30 covered by over 3 feet of fresh snow. The trail breaking was absurd and visibility was almost nil. We could feel the trail undef the snowpack, but could see it. As the third guy on the first rope if I stepped incorrectly, I was buried in bottomless powder up to my chin. We took turns breaking trail, the visibility lifted and slowly we worked our way onto the upper Harper. Late in the day I broke trail again through the Icefall. I probed our old track and kept an eye on our wands but still managed to take a cravasse fall over my head. This time the crack was dry and I was able to get myself out quickly, but I was happy to have solid rope mates behind me. Despite a full days effort we didn’t make it back to the cache we had put at 16,800′. We camped cold and tired in the seracs at 16,200′. July 4 was a day to remember. We packed camp quickly, picked up our cache, and pushed up to Denali pass dragging sleds. 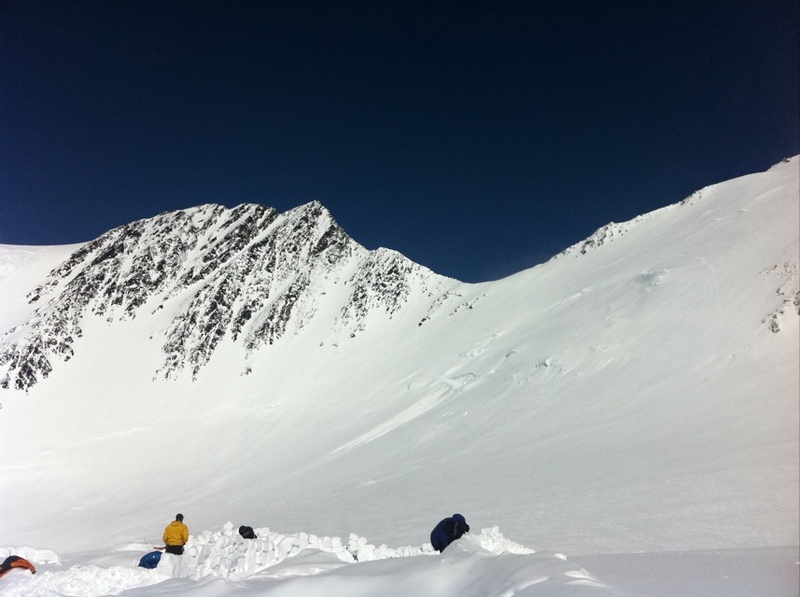 The park service needed our team to staff the 17,000′ camp on the West Buttress, so we completed out traverse and headed down Denali pass carrying over 100lbs each between packs and sleds. Before descending the pass we enjoyed meeting the NOLS team coming down from their successful summit push- way to represent guys. It was good times but descending the pass with sleds was maddening, and we got worked. With skis and wands on my sled it did nothing but barrel roll down the pass, attempting to pull me off with each turn. Everyone else’s sleds seemed to slide fine. The profanity emanating from my mouth was not one of my finer moments, and hitting the 17 camp never felt so good. We had completed the traverse and were in spectacular position for the summit. This entry was posted in Alpine Climbing on July 15, 2011 by sticker1.